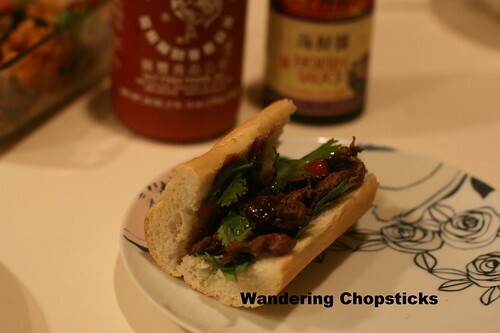 Since my brother said I was overthinking the Pho Burger with Vietnamese Beef Noodle Soup Spices by making noodle "buns," I also sliced some beef and seasoned it with Pho Bo (Vietnamese Beef Noodle Soup) spices and made a Vietnamese sandwich. 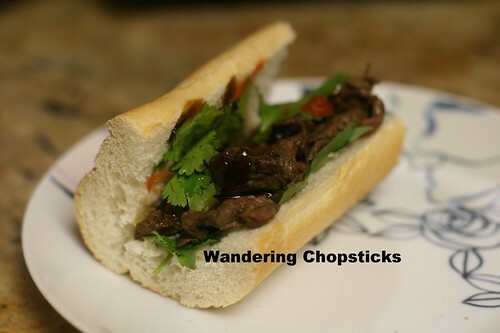 Added the usual pho garnishes of cilantro, basil, bean sprouts, and scallions, drizzled some Sriracha and hoisin sauce, and it was pho bo in a banh mi. Since there was plenty left after dinner with my brother's family, I figured lil' sis and oldest nephew would like to try too. So I packed everything up and drove down to San Diego to share. The verdict? Everyone liked it and I had no leftovers. 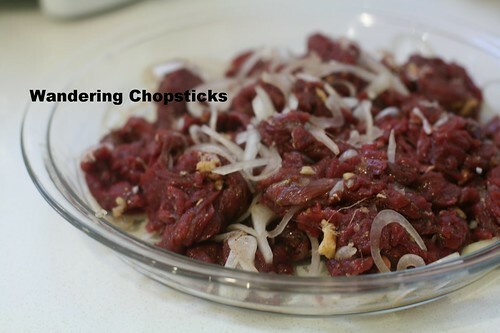 In a bowl, add 1.5 lbs of sliced beef, a sliced small onion, a minced 1-inch knob of ginger, 2 minced garlic cloves, 1 tsp salt, 2 tsps fish sauce, 1 tsp ground cinnamon, 1 tsp ground cloves, and 1/2 tsp ground black pepper. 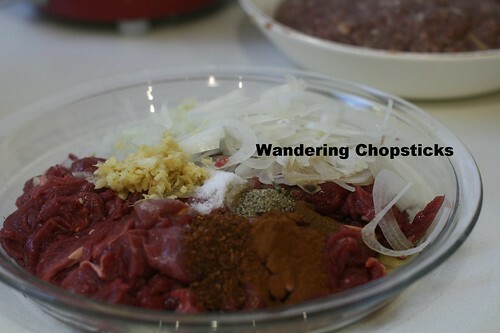 Mix thoroughly and leave to marinate in the fridge if you wish. 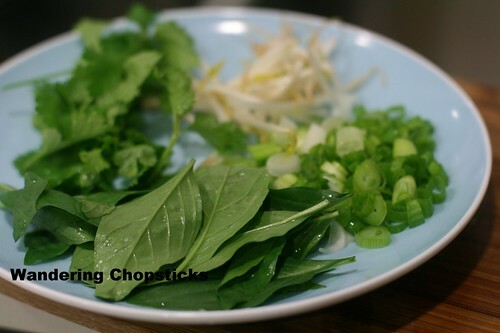 Meanwhile, prepare the garnish platter of cilantro, basil, scallions, and bean sprouts. When you're ready to cook, put the French bread in the oven to toast. 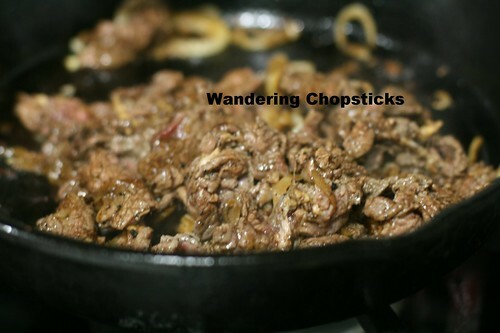 In a pan on medium-high heat, drizzle a bit of oil and add the marinated beef. 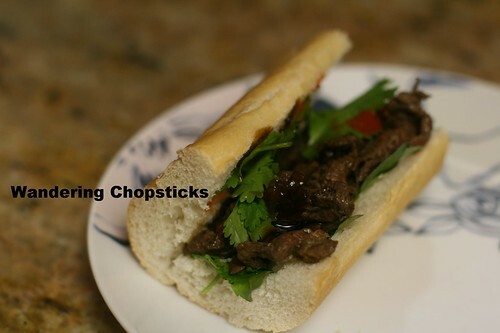 Stuff the French bread with the pho-spiced beef and add whichever greens you wish. 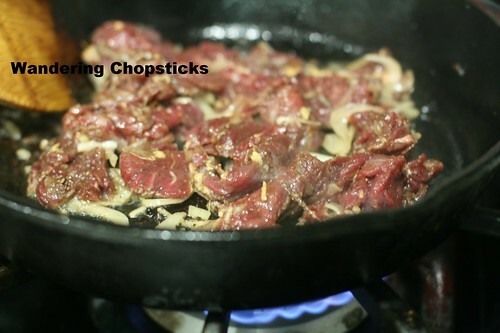 Add a few squirts of Sriracha and hoisin sauce. Look, Whiskey, lil' sis' baby wants some too. Too bad he can't have any. He'll just have to settle for some snuggles instead. 3 years ago today, Spicy Macaroni and Cheese with Chicken. 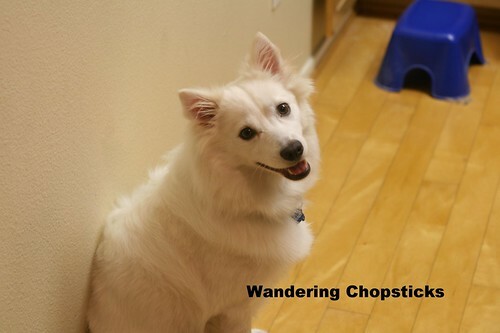 4 years ago today, I discovered that Tastebook stole more than 20 of my recipes. Grrr! 5 years ago today, Ca Tim Nhan Cha Tom (Vietnamese Eggplant with Shrimp Paste). 6 years ago today, Bananas Frita (Cuban Fried Bananas).